I'm having bad luck with books lately and this one was another DNF for me. I've said over and over again that I have a hard time with a book if I don't like the main character, especially if it's written in first person. Grace is struggling with the death of her mom, which I understand. But I made it about a third into the book and it wasn't getting any better. On top of that, I thought she was mean. And then she started doing things that didn't make sense even for her -- like not caring about someone but then freaking out and chasing him when he left her, and I just couldn't do it anymore. I think Alexei was supposed to be dark, hot, and mysterious, but he annoyed her and he annoyed me. I liked Noah, but that alone wasn't enough to keep me going. But let's end on a positive note. I really enjoyed hearing about life on Embassy Row. I love the backdrop for this story because at its best it has normal high school antics but definitely not in a normal high school setting. The descriptions of living at the embassy and the scenery around it were absolutely fascinating to me. I've decided to try reading Ally's Gallagher Girls series since I didn't finish this book, and so far I'm enjoying it. With that book, too, the setting and scenery are so unique and entertaining. 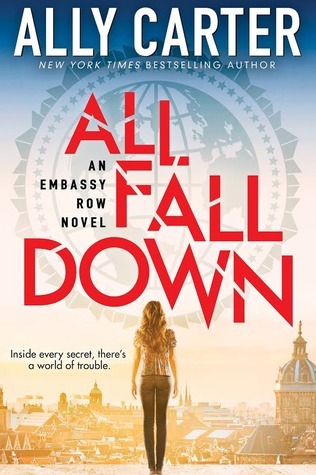 All Fall Down is the first book in Ally Carter's new Embassy Row series. We are introduced to Grace, who is the sixteen year old granddaughter of the U.S. Ambassador to Adria. At the age of thirteen she witnessed her mother's murder and now she is determined to find the killer. Her family insists it was an accident. They want her to move on and take over the responsibilities of the lady of the house...A.K.A. embassy...now that her grandmother and mother are no longer around. While attending a formal event at the palace with her grandfather, Grace is positive she spots her mother's killer. Her friends, several teens from some of the other embassies, volunteer to help with the investigation. She needs to prove the "scarred man" killed her mother and stop him from killing again. I loved seeing how all of the teens used their unique abilities and skills to work together regardless of their nationality. Megan is a genius who can hack into just about any computer system. Rosie is a former gymnast who is great on her feet and can tail just about anyone without being detected. Noah has not only the resources of one embassy, but two. His Mom is the ambassador for Israel and his father is the ambassador from Brazil. By the end of the book we discover that appearances are often deceiving. I don't want to give away any spoilers, but there was a surprise revelation at the end of the book that sets up an entirely new angle for the series. I can see this turning into the next Gallagher Girls/ spy series with global issues at stake. While the Russians and Americans may still walk a fine line politically, the children and grandchildren within their embassies see no problem in working together to protect their loved ones. Ally is off to another great start with this series and I look forward to reading the next Embassy Row novel. I just hope she will continue to write some additional Heist Society novels as well. I love Kat and Hale and don't want to see their story end any time soon. Perhaps they could even make an appearance on Embassy Row someday! Hint...Hint... That would be an exciting twist for your fans, Ally.